Load the entire half million or so keywords all at once (approx 10-40 secs depending on computer speed). However once loaded we cache the query to disk (Build 75+) and reload from cache next time you start up. You can refresh the Index at any time by re-clicking "Load Full Index". This is how Microsoft currently do it. As you type we load up to 2000 keywords, performing a keyword query every time you type a new key. A Keyword lookup of 2000 max page size is fairly quick to perform and is works well on slower PCs. 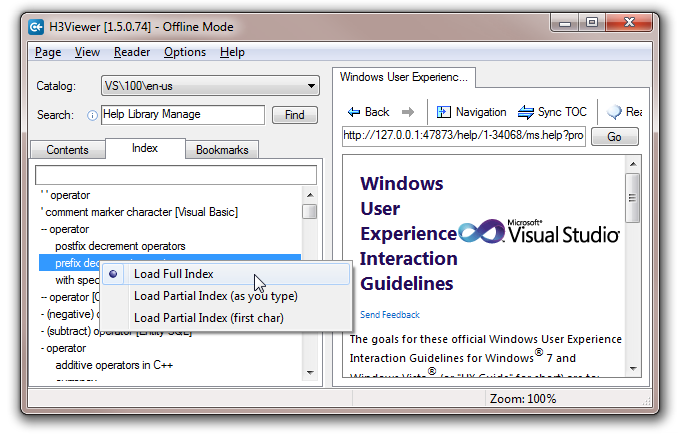 Partial Load (as you type) is new to Build 72 and is now the default mode. When you type the first letter of a keyword we perform a keyword query and fill the list with all keywords starting with that letter (Typically around 45,000 items). As you type more characters, we simple scroll you to the match and no more queries are performed unless you change the first letter of your query. Good for faster computers or when you want to see a fuller list. The Index mode is persistent (ie. next time you start H3Viewer, index mode will be the same as last time). After loading the index the status bar will display something like "Keywords: 10,000\13,000" for 20 seconds -- Meaning 10,000 top level keywords found, 13,000 total keywords if you include all second-level keywords). These figures do not include disambiguator results which can expand inline when you click on some items. Also in Build 72 we have a slight delay between key entry and performing the query. This allows you to type a full word (if you are quick) before a query is performed. You can switch this delay off or change the delay time in H3Viewer.ini. Currently the default is 300ms, which means if you type s-t-r-i-n-g with less than 300ms between each key press, the query wont happen until you finish typing (300ms after the last letter is pressed). If you type s-t-r then wait > 300ms, then a query is perform on "str". If you type really slowly (>300ms between each key stroke) then you will see a query performed after each keypress. You may prefer to bump this up to 500ms. Set to 0ms to switch off key delay.